Sully is like a warm, comforting mug of cocoa, easing you into relaxation as your grampa Clint Eastwood spins a yarn of a Real Thing That Happened Not Long Ago. On January 15, 2009, United Airlines flight 1549, captained by Chesley "Sully" Sullenberger (Tom Hanks), took off from New York's LaGuardia Airport bound for Charlotte, North Carolina. Moments after liftoff, a flock of birds collided with the plane and destroyed both engines. With only 208 seconds to act, and not enough speed or altitude to return to LaGuardia or land in Teterboro Airport in New Jersey, Sully makes the impossible call and in turn performs the impossible: he lands his airplane in the Hudson River intact, saving the lives of all 155 souls on board. It is the first water landing of an airplane ever performed without a single loss of life. It was called the "Miracle on the Hudson." Sully is a hero. Who doubts this? Not Eastwood, and not Sully. 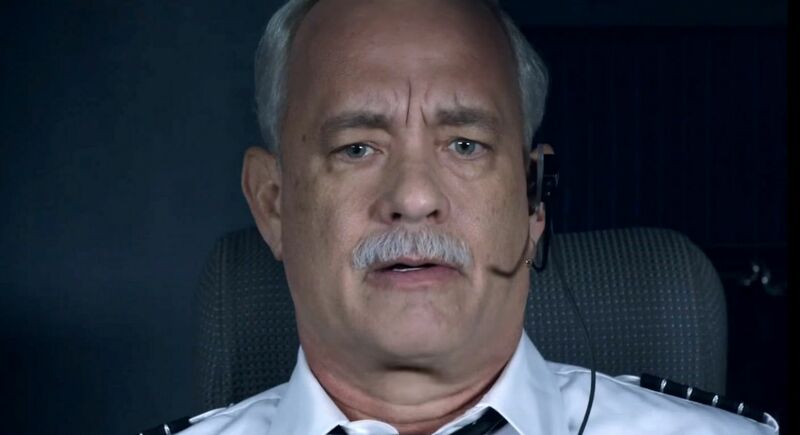 Played with quiet dignity by Hanks, Sully attempts to balance his newfound celebrity with the National Transportation Safety Board's investigation into his competence in the days following the incident. The questions of whether Sully and his First Officer Jeff Skiles (Aaron Eckhart) obeyed proper procedures during the emergency are the NTSB's main sticking point. They claim the left engine of the airplane was operational, despite Sully's claims, and that their computer simulations showed the aircraft could have been landed back at LaGuardia. With class, stately elegance, and remarkable visual effects depicting the dramatic landing of the airplane in several stunning sequences, Eastwood and Sully disprove anything but the quick thinking and calm, experienced professionalism of Sully and Skiles saved the lives of everyone on that plane. Eastwood depicts the heroic response of New York City's rescue teams that rose to the occasion to quickly disembark the passengers from the waterlogged aircraft with aplomb. Sully himself is finally allowed a genuine moment to feel well-earned pride at his heroic feat. In Sully, we know that everything is gonna work out in the end, and then you know what? It does! Sully leaves us with a flying high feeling. As the plane went down in #Sully, the stewardesses chanted "Brace Brace Brace!" Shoulda done it #GameOfThrones style: "Shame Shame Shame!" Also, when #Sully landed the plane in the Hudson, it would have been cool if Godzilla was still there. Added an exciting twist! Clint? I wonder what drunk Denzel doing coke off the stomach of his naked stewardess has to say about #Sully? He's landed a tougher #Flight.